Contemporary style with lots of colour options. Many types of materials are used in furniture, both on the inside and out. Take a look around your home and this will be quickly aparent. A plywood table, depending on design, exposes and takes advantage of the beautiful laminated structure. Each layer of real wood can be seen at the edge, alternating dark and light shades. The real beauty lies is the inherent strength of this material. A plywood table can be completely made from the same material throughout or used only for the top or the base. This alternative to solid wood can be used for dining, desks and other applications. 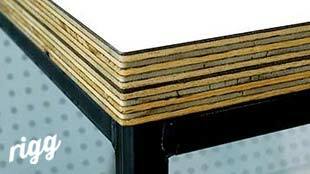 Clear lacquered plywood can be used alone for a table top or other materials can be used as the surface. When clear lacquered the natural beauty of the wooden surface can be seen. When a different surface is desired we can offer an excting range of high pressure laminates (eg Formica) as well as zinc, copper and brass. This is most prevelant in our ranges and has the most "refined" edge detail. Each layer appears quite thin and consistent, usually with contrasting alternate stripes. We also sometimes use this as it can have a more characterful, slightly rustic appearance. It can look good when used in industrial style furniture as an alternative to solid wood. Equally it can contrast beautifully with pure surfaces such as Formica. Please see our Grafik Cuboid Plywood Coffee Table. Each layer tends to be thicker than in the type above, with some having a slight mahogany hue. The corner shown here on has a double thick top. This is made up of 2 sheets of 18mm board to give 36mm deep of laminations on show. The surface of white HPL adds a further approximately 1mm of height. As hinted above the effect is quite striking with the bold stripes and simple matte surface working together. The result is practical, decorative and refreshingly contemporary. This can look good on small and large pieces. Also consider other colours and metals such as zinc, copper and brass.